Stress testing is an essential screening exam for coronary artery disease. The EncaptureMD Nuclear Modality Report is optimized for routine stress, Nuclear stress including exercise and pharmacologic stress and MUGA scanning. 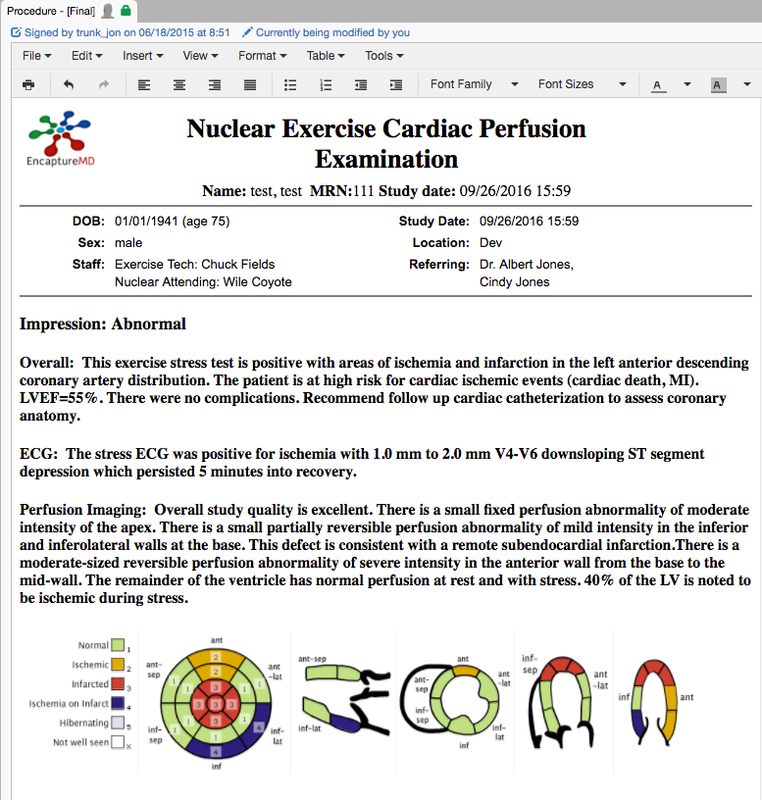 EncaptureMD can supplement existing Nuclear viewers or View DICOM images via secondary capture, thereby allowing a single, unified source for all Cardiology reports. Easy to learn and use. The team all works in one system. Handles all roles - Nuclear stress tech and attending, Exercise stress tech and attending. Treadmill integration streamlines workflow - waveform PDFs and stress data flow effortlessly into EncaptureMD fields. It even works if the patient has to switch between an exercise and pharmacologic stress test. Works side-by-side with existing reading stations. 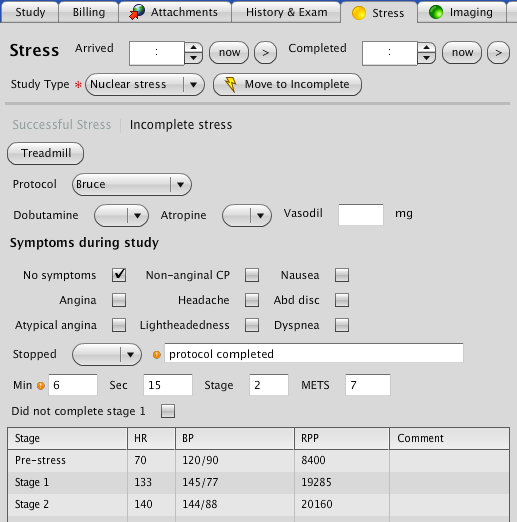 Successful and Incomplete stress protocols allow for complete reports when an exercise study is switched to a pharmacologic study. Simultaneous User features allows multiple people to be entering data on the patient. Duke treadmill scores are calculated -it even converts Modified Bruce and Naughton protocols to Bruce protocol METS for accurate results. 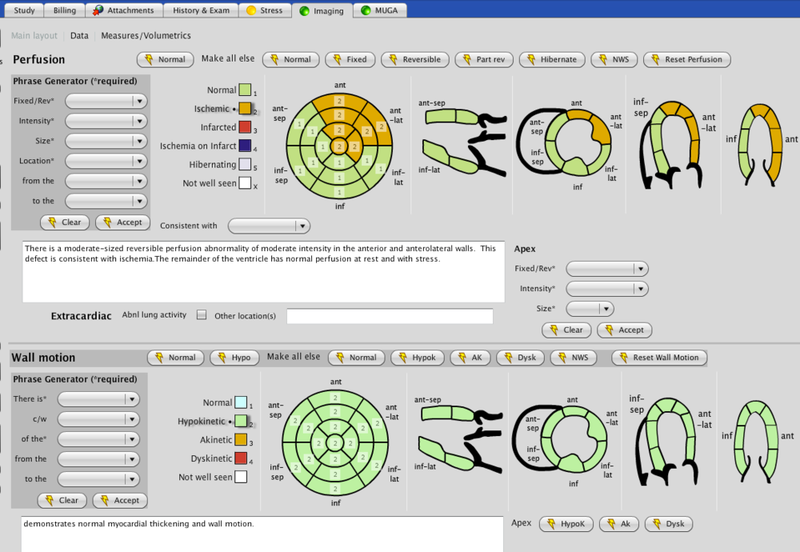 EncaptureMD is compatible with all toolboxes and can be used in side-by-side mode or we can provide the Emory toolbox viewer for off-camera reads. Enter manually or add the optional treadmill integration. Gracefully handles conversions from exercise to pharmacologic stress. With just a few clicks, define the perfusion and wall motion diagrams and text. Normal is just one click. Overall result at the top. Major details just below. Diagrams included.